I return to work next Monday. The wave of emotions that sweep through my heart are so bittersweet. The subject of staying at home versus returning to work has been deeply discussed countless times throughout my maternity leave and as my first day back to work quickly approaches it seems to occupy my thoughts all day. We’ve reviewed our finances, weighed our personal reasons, considered our career goals and more. At this time in our lives we think it makes the most sense for me to keep working. Our daycare doesn’t start until September so both Grandmas are coming to stay with us for two weeks each to watch Caroline for the month of August (we are so lucky and grateful)! Hopefully this eases my transition going back to work a bit better. However, I hope to set a wonderful example for Caroline and show her that her mom can have a fulfilling career, contribute in some way outside the home and still be a loving mother. I want to show her that her mommy was created with spiritual gifts, passions and talents that include and extend beyond being a mother. I want to show her at an early age that there are rewards for hard work. I want her to see Matt and I as equally involved in her life. Most of all, I want to exemplify strength, endurance, dedication and tenacity, all with joy and love for her.I’ll be signing of from the blog this week to soak in these last days at home with Caroline and will also be taking a short break as I get settled back into work. Unfortunately, when my cup is too full the blog is the first thing in my life to get cut out and this happens to be one of those seasons for me. I promise not to stay away too long! I’ll miss this baby-wrecked living room. Love this post! I am a working mom too. I am glad you found a daycare you love, it really helps with the transition. I cried alligator tears the first day I had to drop Kennedy off but each day it gets easier. Your favorite part of the day will be picking her up from daycare, especially as she gets older. The smiles, reaching for you and saying "mommy!" will warm your heart. Enjoy this last week Momma! Good luck next week. It is such a blessing to have a job you love. I hope the next few weeks go as smoothly as possibly. Beautifully put my friend. And as a working mom myself, I promise you that you can do it. It's hard work, but it's do-able…especially when you have a flexible work environment! I'll be thinking of you these next few weeks! Thinking of you my sweet friend. Beautifully written. 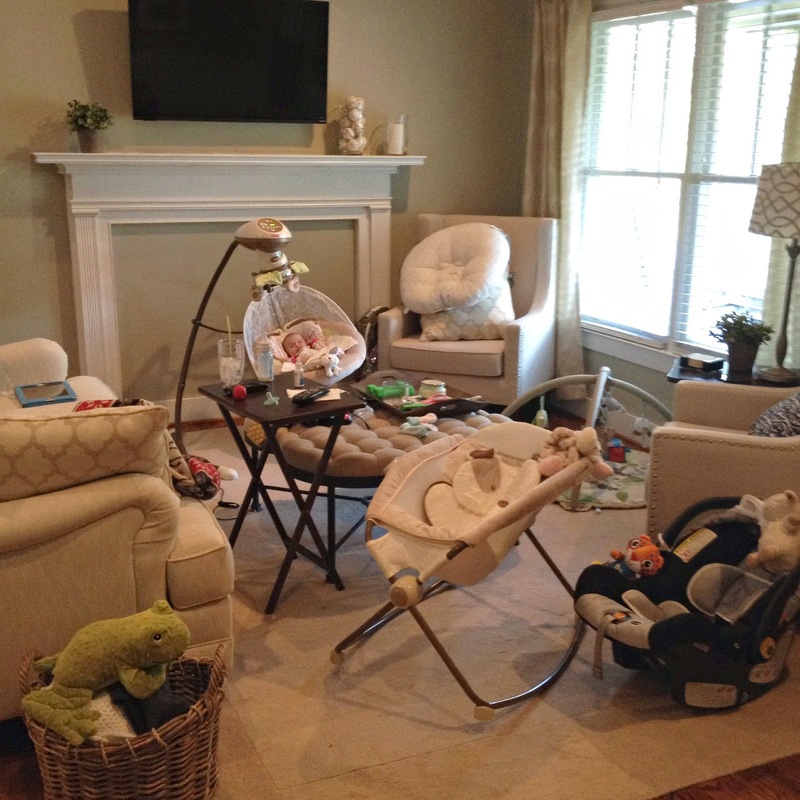 I have a 5 week old and my living room looks the exact same way!!! Haha I will be staying home with her, but I didn't love the job I had before so I think that made my decision so much easier. Good luck next week getting back in the groove of things, you can do it!! I cannot imagine! Sending you happy thoughts and special memories this week! Hang in there as you adjust to this new schedule!! I know you'll do great!! Enjoy your time before you go back. I never had to go back after mine but always chose to. It makes you a better mom, wife and person I think! Hugs! Good for you for going back to work mama! It will be so tough but you can totally do it! You're lucky to have a job you love and want to go back to, that's pretty rare. Don't let anyone make you feel bad about your decision! My mom worked while I was growing up and I admire her for it and hope to do the same as long as I can. I worked for the first 7 months of my son's life before we made the decision for me to stay at home. It was tough at first, but it does get a bit easier every day. I think it's wonderful that you have made a decision that fit your needs as a family, and that you have a job that you love – that is indeed rare! You guys will be just fine! Good luck!! I have a feeling that once you get a schedule down you'll do great! Enjoy this last week at home!! Can't wait to see & hear more so, I hope you're not gone too long either!! 🙂 Hope you have a great week!! I was in your same position a little over a year ago. It was the hardest transition ever, but now being a working mommy (one year later) its been the best transition. Our son, Henry loves and thrives in daycare. Its made me a harder worker because I know the hours I am at work I need to focus so I can get home and be with my family. I think its also made me a better mommy. I try to fill the time we do spend together with fun, and adventure, and lots of family outings. The weekends fly by, but they are so much more fun and fulfilling now. It will be a hard week, but it will also be a really good step for your family. Life will be crazy for sure, but its the best kind of crazy. Good luck!! What a wonderful post for any woman! You go girl! I always felt that when we were graced with kids I would want to stay home but I am also one of those lucky ones that love my job. I do believe that my opinion has changed on taht subject matter. I also see how my nephew Palmer just thrives in daycare. His manners and love of learning is simply amazing. Enjoy your last week and soak up all the snuggles! Much love!!!! Well said! I don't think I've read a post that so beautifully touched on the subject! Sending lots of positive thoughts as you start back to work! Sending hugs & thoughts your way!!!! What a blessing that you have an amazing job that you adore! Hoping for a smooth transition for you, baby, and hubby the next few weeks!!! Good luck mama! That is such an excellent perspective. I wish I had been so clear thinking when I returned to work. I was wracked with guilt and agonizing over the decision. It didn't take too long to come to the same realizations that you already have. I can love my kid, my job, and be a great mom and a professional woman – all at once! Though not without some hard work and sacrifice. I hope your transition from home to work goes smoothly and wish you all the best! Enjoy these next few days at home! What an insightful post! Good luck with the transition and enjoy your "time off"! This is a great post and as a working mom to an almost 2 year old, I'm on maternity leave with my 3 week old- I feel the same way about going back to work. I really do enjoy my job, which that makes all the difference. You can do it mama and there will be days and weeks that there is never enough time but the example of a strong woman not just bc you work but just the values you exude will be priceless to your daughter! Enjoy your last week at home!!! Also- my advice from having done this with just one kid…if you can work it into your budget and don't already have one- getting a cleaning lady on at least a monthly basis is worth it's weight in gold and will give you more time with your babe!!! Thank you for sharing! We are expecting our first in December and what that will mean for me has been a tough topic of conversation. It's been really helpful to read about others' experiences to gain perspective from both sides. It's such a personal topic for people and I understand why many shy away from it. Enjoy your week – and good luck heading back to work – I'm sure you were very missed! A tough transition for sure but having been back at work for a few weeks now, it really does get a little easier every day! Let me put it this way: Before you had Caroline, think of something that made you super excited to get home from work at the end of the day. Knowing that a fun package had been delivered to your house, a date night with your husband, etc. Knowing that I'm headed home to my baby at the end of my work day feels like the most fun surprise and makes me feel practically giddy in the afternoons, not to mention our time together on evenings and weekends is that much sweeter! My prayers are with you for your transition, enjoy your time with her this week! As a working mom I can tell you it's not easy, but with your support system behind you I know that you can do it!! Try not to let the "mom guilt" get to you too much when you know in your heart you are doing the right thing for your family!! Good for you girl. I can imagine how hard it's going to be to get used to your split schedule, but I think having your mom and mother-in-law for the first month will be an enormous blessing. And, you may find yourself enjoying going back to work even more than you think.I'll be very curious how the whole transition goes, so keep us looped in. I'm positive you'll do absolutely great. "However, I hope to set a wonderful example to Caroline and show her that her mom can have a fulfilling career, contribute in some way outside the home and still be a loving mother", I love that. Good Luck as you transition back in! I can't wait to read about it. I know going back to work couldn't have been an easy decision, but you are so very blessed to have the grandmas come stay and help out. I know Caroline is going to love spending some extra time with each of them! I love what you said…"I want to show her that her mommy was created with spiritual gifts, passions and talents that include and extend beyond being a mother" and it is really the best way to explain this. Best of luck to you as you return to your job and enjoy the last few days as a SAHM! You can do this! Thank you for such a positive post on working mothers. I, too, work outside the home (we have two littles) and often I feel like I am always defending my choice to work. However, I think working makes me a better mom and I am grateful for the "extras" it provides. And while I've had my sleepless nights and worrisome moments, I've also had my good days.Thank you for being so gracious about your choice. Good luck gal!! It won't be easy, but you will get through it and each day will get better and better. Proud of you and enjoy your last few days at home with that sweet baby! This is such a wonderful post. I worked out of the home for the first year of Dell Harper's life. I think it is so important to go back to work with an open mind, and give it a shot before immediately deciding to stay at home or remain in the workforce. You never know what is best for you! Beautifully thought out and written post. You can do it and your family will be stronger for it! Best of luck and success. Your baby is beautiful! Enjoy this last week at home! It is amazing how quickly our babies grow up!! I will be thinking of you and praying for you next week. I'm so happy that you'll be able to transition back to work with your daughter with your mother or mother-in-law. So glad that there are other moms out there who are able to help me know that it is okay to go back to work! It all goes so quickly. I am already on Maternity leave (in CA you can take off the 4 weeks prior to your due date) and won't be returning until Jan 1. I know I am so fortunate to have so much time off but I already get stressed about the idea of returning to work. Hopefully your transition is a smooth one! Own your decision – it was mine, too. I want my little girl to grow up and see how fulfilled her mom is by making a difference in the world, outside of the home. It's what I hope she does someday, too. This is such a beautiful post. I have an 8 month old and to this day I still feel guilt for being a working mommy. I know that this is the best decision for our family and though someitmes it doesnt feel like it. It is hard when thinking about it, but I promise, it's not as bad as you think. Someone told me I'll enjoy the break and adult time and I really do. It helps that Shelby TOTALLY loves her school and everyone that works there as well. As you might remember I wrote a few years ago in my 'going back to work post', I worked WAY TOO HARD for my career to let it go. In TVland, I would never be able to get back in. Hang in there and maybe I'll see you next week in the lobby! Heck, maybe we can do lunch outside one day! I'm a daycare teacher in an infant room, and I can see how hard it is for moms to leave their babies for the day! Rest assured that she is going to be cuddled and cooed over all day long, and that you will always be number one 🙂 Also, think of the wonderful example that you are setting for your daughter, being a powerful, working woman! Just wanted to reassure you from another working mom that the anticipation of going back is really the worst part! Also, when I wrestled with the same indecision on maternity leave, my husband reminded me that I can always quit, but I can't just get the job back–so it's good to wait to make a permanent decision until you are sure! Best wishes, mama! It was hard to go back to work after my girl was born, but it was honestly easier than I anticipated. hope the first day back went well! best wishes! I hope the transition back wasn't too hard. Hi Christine…congrats on your girl (a few months late!). I love her name!! I feel so sorry that you have to go back to work only after 12 weeks!! In Canada you get a year off!! I am sure it will go great! It will be hard, but I agree, you are setting an example for Caroline! So great that both gramma's could be there to help out. I am just now finding this. Been out of the blog world for a while. I am returning to work tomorrow. My little one will be 8 weeks old. My mother in law will be keeping him. Going back to work is one of the hardest things I will have to do. I don't love my job like you do (looking to make a change). I've desperately been looking for positive working mothers… mothers that don't mind working. I work in a small office and the mothers in there pretty much hate that they have to be there so I'm surrounded by that negativity. Doesn't make going back very fun. So… thanks for writing this!